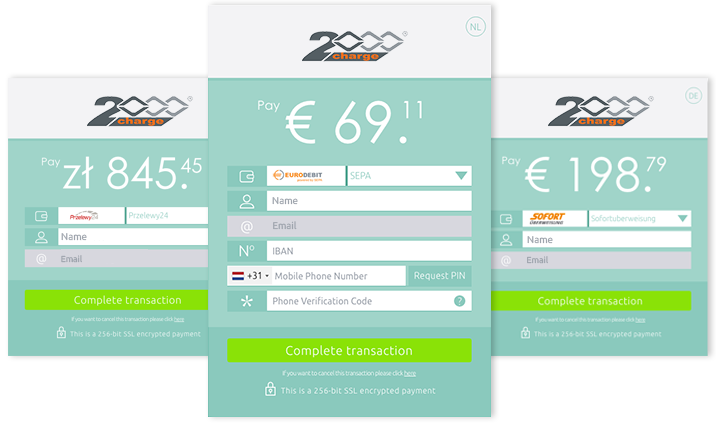 By selecting 2000Charge's hosted page, you can have the most popular local payment methods with a simple integration. Submit us only the basic parameters via API, and we take care of the rest! Jump to the implementation page! "Automagically" locate the consumer via the geo-location system and display the appropriate payment options and currency. SMS Verification for each SEPA transaction provides additional layers of security with pattern matching reports and alerts. New payment options can be added from the Merchant Portal in only a couple of minutes. No extra coding needed! Display the appropriate currency and payment options to each particular consumer with fewer fields for quicker checkout. Simple, intuitive implementation including only price, amount, customer's email and customer's country. Ready to test our Hosted Checkout? Create an account for free or check out our documentation!